Adjusting to a newborn can be challenging. Helping your toddler adjust to a new sibling and all that comes with it, including constant feedings and changing, can also take some time. Each baby is different and each toddler is different, so you may have the perfect combination and everything goes smoothly... or you don't. Some newborns eat efficiently and make it easy to move around while breastfeeding, and some are trickier to navigate. 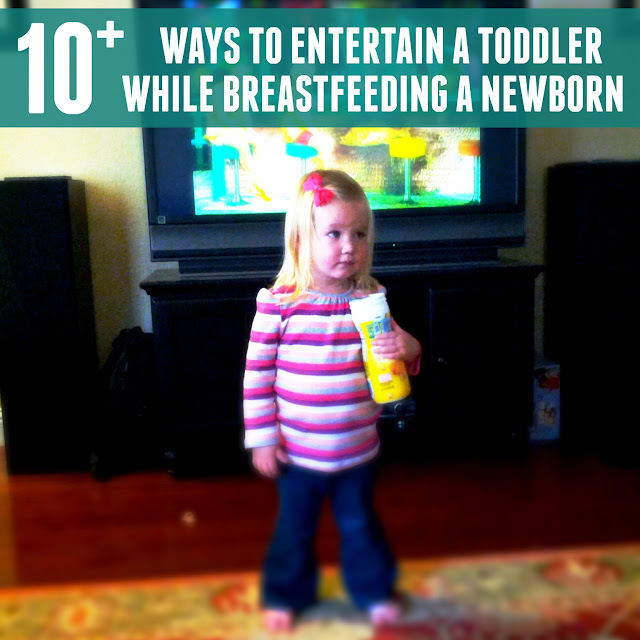 Teaching toddlers to play independently while you breastfeed or finding way to spend time with them while you nurse your newborn can help make the transition with the new baby a bit easier. Today I'm sharing 10+ simple ways to entertain a toddler while breastfeeding a newborn. I'd love to hear your best tips as well! Please share them in the comments. When I have a newborn and am exhausted, I have no problem with turning on the TV for my toddler. We watch all sorts of cartoons on Netflix and relax and chat while I feed the baby. Sometimes I take a nap. Since my newborns usually nurse for an hour every other hour all day long, I try and save TV for only a few of the nursing periods. This is usually our favorite activity. I just have my toddler grab a pile of books and sit next to me while I nurse. We participate in a Virtual Book Club for Kids so we always have books lying around to read together. 2. Do some simple puzzles and matching activities! 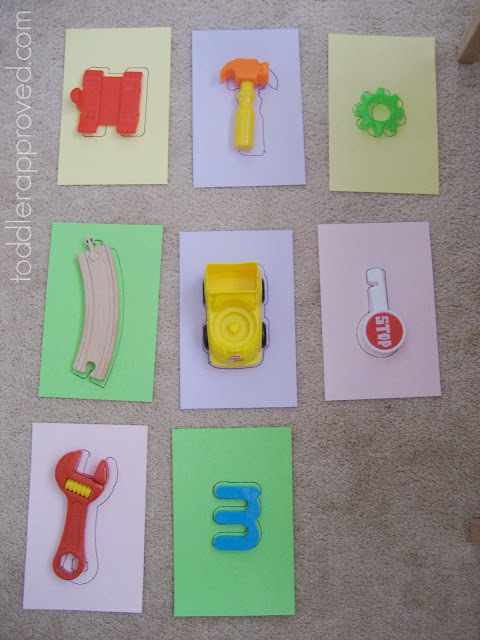 We love several of the Melissa & Doug Puzzles and activities for independent play along with several other toys/ideas mentioned in our Independent activities for toddlers posts. My favorite Melissa & Doug puzzles are the pattern block puzzles and See & Spell Boards. 3. 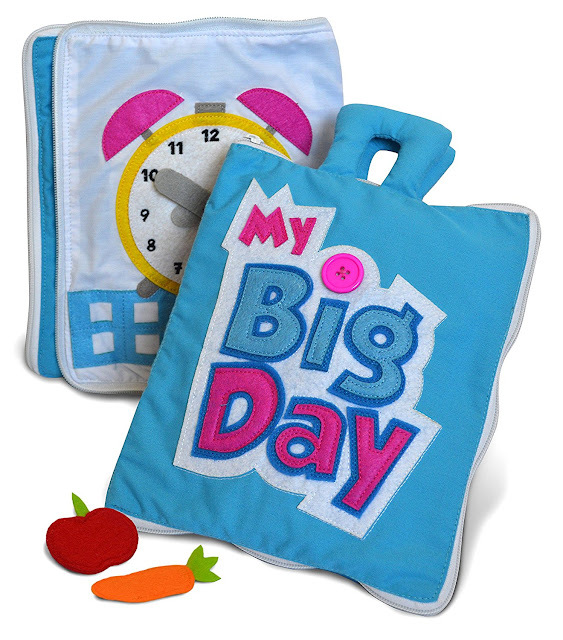 Put together a simple snack bag that your toddler can use by herself. I like to have snacks easily available that aren't too messy like crackers, Pirates Booty, apple slices, and cheese sticks. I either put them out before I start nursing or keep them in an easy to reach spot in the cupboard/fridge. I usually nurse the baby in our family room which is right next to our kitchen, so I can see my toddler while she eats and we can chat. 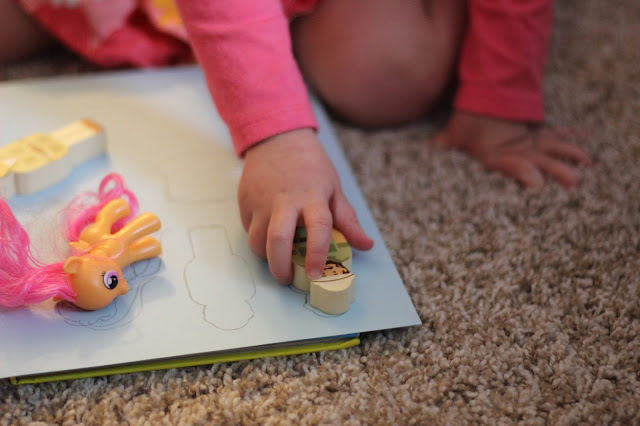 We love making DIY puzzles by tracing toys onto a sheet on paper and then matching them. You can check out our DIY Toy Puzzle tutorial here. Make a few of these ahead of time and then hide the toys around the room where you are nursing. 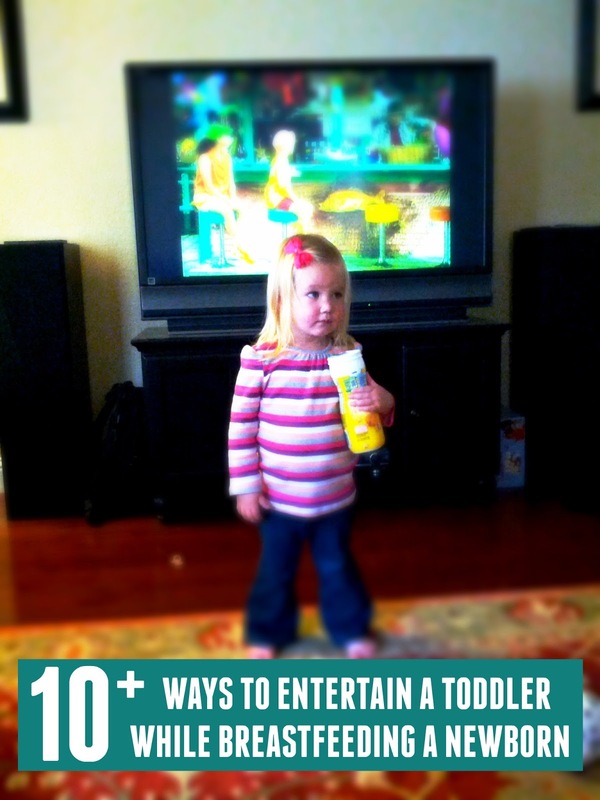 Your toddler can then find the toys and match them to the right spot. My kids love to chat. Often while I am breastfeeding I can just sit on the couch and ask them questions and tell them stories about when they were babies or when I was little. They love listening to stories! They also love to talk about themselves and their favorite toys! Well-made quiet books are awesome for when you need your toddler to be busy while you are nursing. I love The Quiet Book By Curious Columbus. Other soft books, sensory books, or fabric books work nicely too! 7. Have a special box filled with toys you only pull out when nursing. Having a special set of toys that only came out when I was occupied with the baby worked out really well! I kept the toys in the garage or a cupboard away from our main toys and occasionally rotated them. My toddler was much more engaged with the toys because they were a bit more special. It really didn't matter what they were, as long as they were toys he hadn't played with in awhile. Little People sets, Magformers, and fun cars and trucks were a few favorites. 8. Go on a hunt! Before I start nursing I sometimes will hide several objects around the room that my toddler can find. I might hide paper hearts or shamrocks or a themed object related to whatever holiday is coming up. She hunts for the objects while I nurse and encourage (and pass along hints). Stickers are great for helping strengthen little finger muscles. 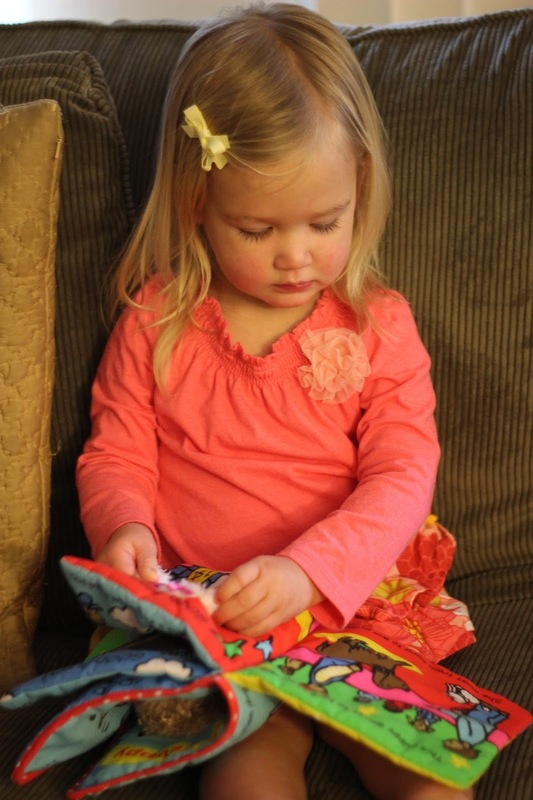 Giving your child a pack of stickers and a piece of paper to stick them on can keep them entertained for awhile! If your child can't pull the stickers off entirely by herself, get them started for her by pulling up the edge on each sticker before share starts creating. Have her come show you her creation once she is finished! 10. Have a baby doll your child can feed/diaper/play with while you are caring for the newborn. Having a baby doll nearby that your child can care for, feed, bathe, and diaper can be a great way to add in some pretend play while also helping your child feel involved with the new baby. Have your toddler feed her baby while you feed yours or give her baby a pretend bath. I always love watching toddlers take care of babies and mimic their parents. 11. Painting in a high chair. Using washable paint or yogurt paint while your toddler is strapped into a high chair is a fun way for her to stay contained and occupied while you feed the baby. We liked trying puffy paint as well. 12. Try out some Learning apps on your phone or the iPad. When all else fails, pulling out the iPad for a short playtime can also keep your toddler entertained. We loved the Very Hungry Caterpillar Apps. They change and update for different holidays and are so colorful and fun! 13. Sensory bins are a blast! 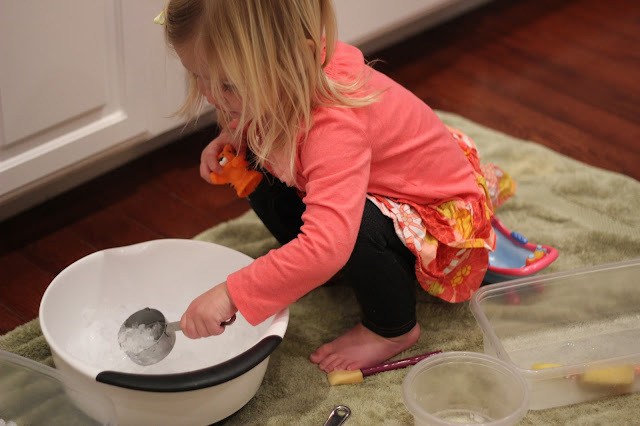 We love cereal sensory bins and ice and water play sensory bins, but they can be messy! As long as you are prepared for that, go for it! I never mind cleaning up if my kids have fun and I get a little brain break for a few minutes. This bug sensory bin is fun and so are ice play activities. 14. 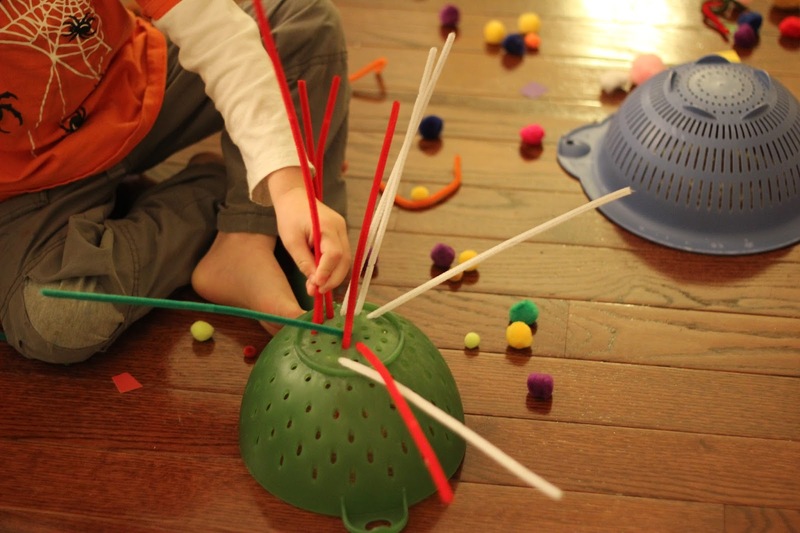 Simple fine motor activities like sticking pipe cleaners into a colander are awesome! 15. Practice cleaning with window markers, a spray water bottle, and a towel. 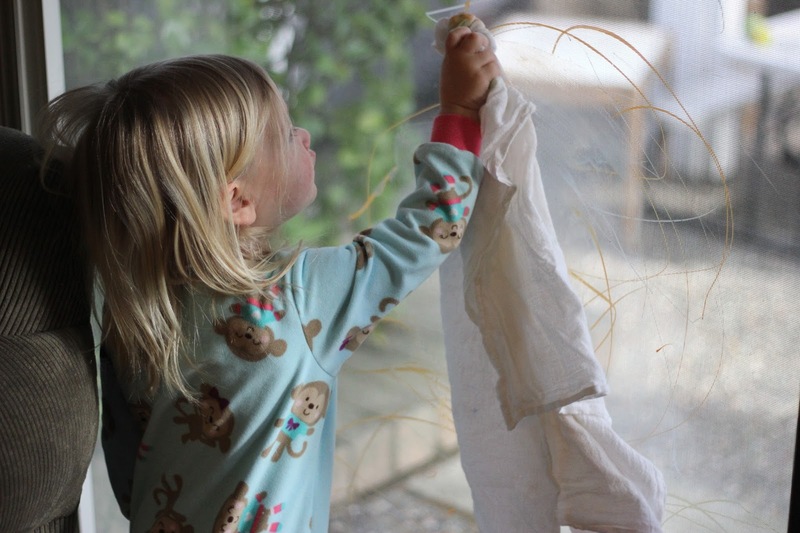 Have your kiddos draw pictures on the window and then clean them off. My kids usually like the spray bottle the most so they end up cleaning the whole window. It is a win-win. At the end of the day it doesn't really matter what you do with your toddler while you breastfeed your newborn as long as you enjoy the time together and you are able to make it as stress-free as possible. If that means iPad and TV time the whole time, go for it. Some moms get really good at being mobile while they breastfeed and are able to resume regular activities sitting on the floor with their toddlers playing while they breastfeed... which is awesome! Other moms need peace and quiet in a cozy spot in order to be able to nurse. Whatever way works for you, I hope you are able to find some fun ideas on our list to try while you make this adjustment! If you have other additional favorite ideas to share with us, please tell us about them in the comments!